May will meet the very ministers said to be plotting to oust her at the start of another crucial week in Britain’s withdrawal from the European Union, which could see MPs seize control of the process from the government. Lawmakers are set to vote later Monday on whether to force through the House of Commons a series of so-called “indicative votes” to gauge support for various Brexit options. Meanwhile May must decide when, or even if, to ask them to vote again on her divorce deal — finalised with the EU last year — which they have already overwhelmingly rejected twice. 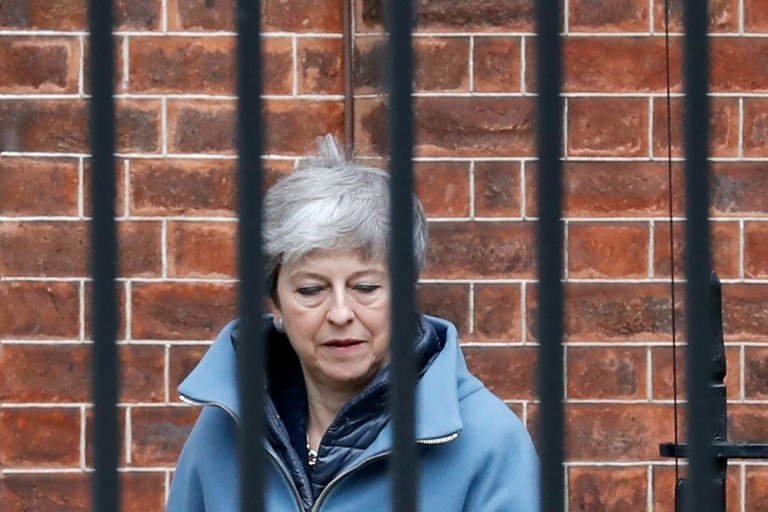 Under a new timetable imposed by European leaders last week, she now has until April 12 to win MPs’ backing for the agreement or find a viable alternative which could include a lengthy extension to Brexit. However, after a disastrous last week, the increasingly isolated leader spent the weekend ensconced at her country residence Chequers “at the mercy of a full-blown cabinet coup”, according to the Sunday Times. The newspaper said it had spoken to 11 senior ministers who “confirmed that they wanted the prime minister to make way for someone else” and planned to confront her at Monday’s cabinet. “It’s not the time to change the captain of the ship,” said Environment Minister and leading Brexiteer Michael Gove. But Brexit-backing tabloid The Sun, Britain’s best-selling daily, called for May to announce Monday that she will resign as soon as her deal is approved and Britain leaves the EU. On Saturday, organizers estimated one million pro-Europeans marched through central London demanding another public vote on leaving the bloc. Following last week’s delay to the country’s March 29 scheduled departure — which MPs must still vote into law this week — the way forward remains highly unpredictable. If May’s deal finally wins parliamentary approval Britain will leave the EU on May 22. It was expected to face another vote this week but the prime minister has told lawmakers signs of “sufficient support” are needed first. On Sunday Tory Brexiteers outside government, including influential MP Jacob Rees-Mogg and former foreign minister Boris Johnson — widely seen as wanting to replace May — travelled to Chequers for talks. “It’s looking very difficult to bring together a majority for it,” finance minister Philip Hammond earlier conceded to Sky News. MPs will resume debate on Brexit on Monday with the chance to vote on an amendment tabled by a cross-party group of senior lawmakers scheduling “indicative votes” on Wednesday. But in a sign of the splits within the cabinet, Hammond appeared more open-minded if May’s deal remains blocked.